Our Rack Mount Enclosures include a variety of powder coated steel enclosures that are available in Slide Out and Swing Out styles. Slide Out enclosures are designed with a slide out master panel shelf and allow for storage of splice trays behind the master termination panel. Swing Out enclosures are designed for narrow depth applications with a hinged swing out master panel and splice tray storage. 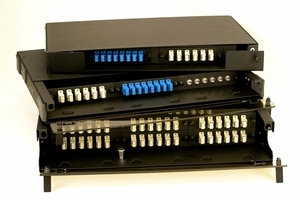 Each enclosure accepts LGX adapter panels(sold separately) which allow selection of a variety of connector styles. LGX adapter panels are 5.3" by 1.2" with two push latches (spaced 4.65" apart).